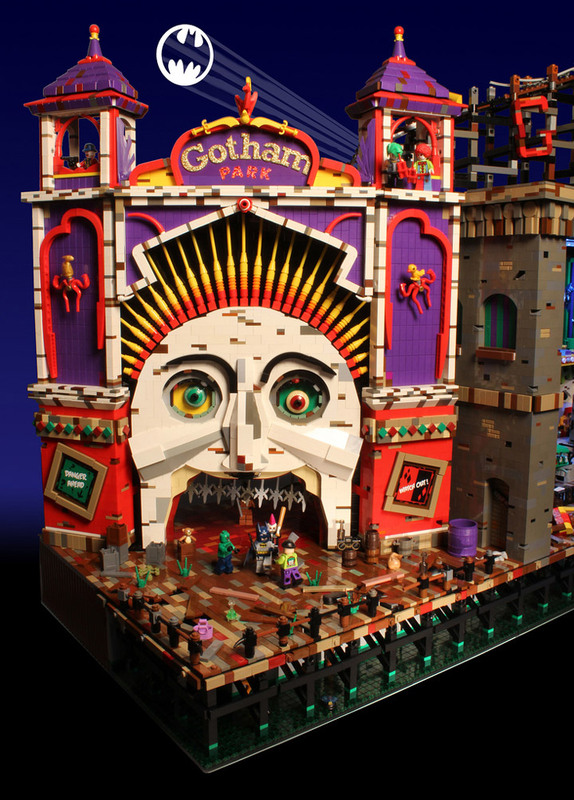 Lego Batman and Robin, Joker’s Funhouse / Gotham Park. Fully Animated MOC. Batman and Joker go together like peanut butter and jam. No other hero / villain duo are as famous or an entertaining. It seems that in every version of Batman (the Comics, original TV show, the Tim Burton films, the Animated Series, the various video games or the recent Christopher Nolan film trilogy) these two eventually have an all out showdown. Usually involving some sort of abandoned theme park or funhouse. 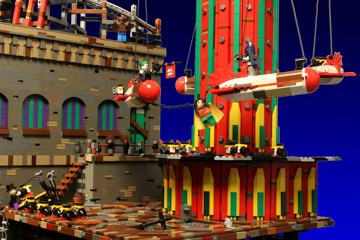 Lego has released their own version of the funhouse with “The Dynamic Duo Funhouse Escape (6957) .” As awesome as that set is, one has to wonder what it would be like if money was not an issue. 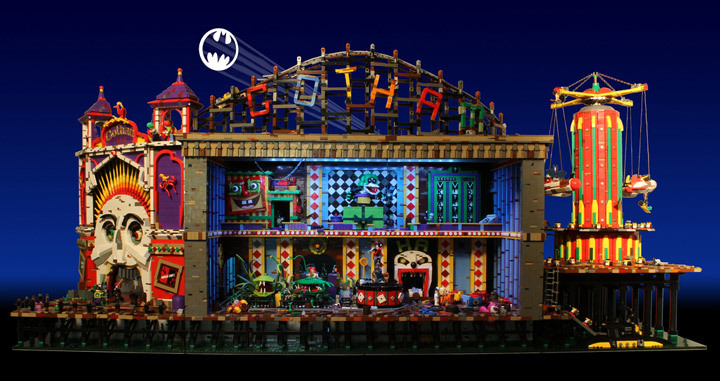 For instance, Brickbaron created “Lego Batman and Robin, Joker’s Funhouse” as a tribute to several Batman video games. This giant automaton funhouse is so much fun. This is Lego at its best. There are three levels built into Joker’s Funhouse, and each one contains a story. On the left side is the entrance to “Gotham Park.” At one time this little seaside park would have been a blast, but has since rundown and has been taken over by Joker and his goons. 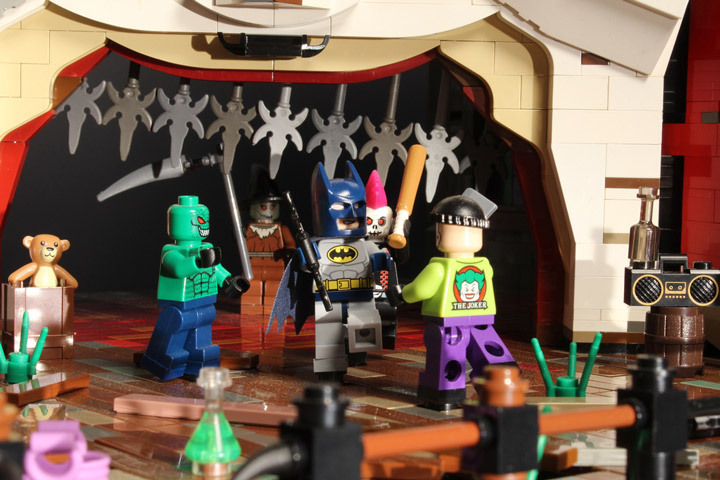 The entrance to the park features an intense fight with Batman, 2 goons, Killer Croc, and the Scarecrow. There are many hidden features, such as Robin up on the roof ready to surprise some bad guys. The whole scene is topped off with a dilapidated roller coaster. Which leads over to the right side of the pier, where a spinning ride has been taken over by Joker and the Penguin. Here Batman and Robin are in a desperate fight for their lives as an army of armed penguins is closing in. The simple spinning mechanism add a lot to the energy of the funhouse. The interior of the Gotham Park is by far the most deadly. Robin is in a fight for his life against Poisen Ivy and her carnivorous plants. 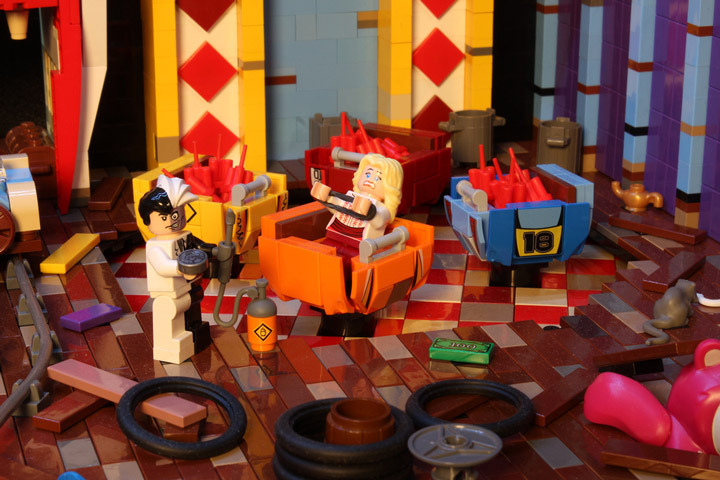 While Harley Quinn is holding Commissioner Gordon hostage over a boiling pot of Lego. Which is not distracting Two Face from torturing an innocent girl with explosives. The Riddler seems to be hosting some sort of decoding game show, while Catwoman is off in the corner stealing diamonds. The whole time this is going on, Batman is fighting a giant robotic version of the Joker in the center. Whew. Even more impressive is that everything is animated with technic and lit with fancy dramatic lighting. Gotham Park is a masterpiece MOC. It perfectly captures the mood and feeling of a funhouse thats been taken over by the Joker. Brickbaron spent some two months working on this creation. And has since been bringing it around to various Lego conventions. 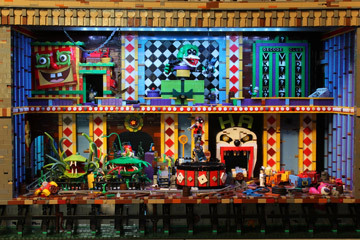 Joker’s Funhouse made its debut at Brickcon 2013 in Seattle.